Ohnoes is an aerosol artist who has displayed his work around Melbourne on walls and galleries with increasing notoriety over the past few years. 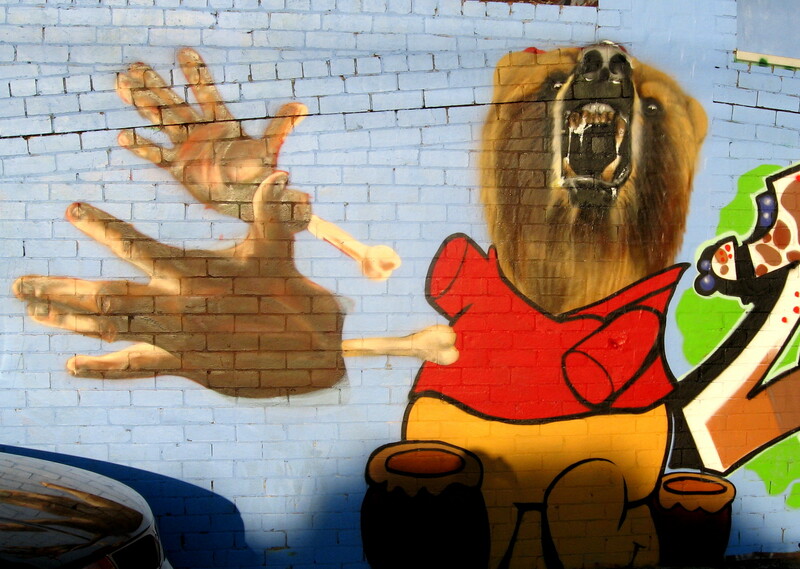 Although well-known in the street art arena, he claims that he is self-taught and has no formal artistic background. Fascinated by certain facets of art at an early age, his interpretation of art was always based on his visual recall. As an example, everything he saw, he tried to replicate, just like someone does when solving a puzzle. The artists of the ‘Arts Hole‘ studio (located in Caulfield), were invited to paint at the ‘All Your Walls‘, exhibition in 2013. Further success was awarded to them when they won a commission from the department store, David Jones; to paint a mural for the ‘Good Food and Wine’ week. Otherwise, if you are out and about, and find any new work by him, remember: the Ohnoes is on you to record and report it! This entry was posted in SprayCanArt, StreetArt, StreetArtists and tagged aerol art, Arts Hole, Ohnoes, spraycan art. Bookmark the permalink.